This two day workshop on 25 and 26 July 2009 at the Guild office is designed to give beginner and intermediate quilters more confidence in working with and selecting fabrics either by colour or pattern and applying them to the quilt designs they will learn to create in this workshop. Participants will bring their favourite fabrics—yes those you have ‘drooled over for years and were afraid to cut’ – along with a collection of associated colours and prints. The key fabrics will be analyzed by colour, print style and pattern repeat and we will use this newly gained information as a foundation for your quilt designs. Participants will be introduced to graph paper design and recording principles as a means of extending their skills and documenting their quilt patterns and will be shown a simple but comprehensive system for calculating fabric quantities. During Day One, participants will ‘debunk’ their fabrics and start designing general quilt pattern layouts and move onto deciding where these fabrics will be placed in their designs. Stylizing of block structures and their supporting role in quilt design will then be introduced with guidance on how to translate your design into actual sized templates ready for cutting and assembly. As the quilt design profile grows, each step will be recorded for accurate retrieval at any point during the class or in the future. Day Two will see individual participants taking their own paths by using their new knowledge by either sampling some of the blocks they will be using in their final design or pursue further design options using graph paper and coloured pencils. The workshop fees will be $55 per day and the class will run from 9.30 am until 3.30pm both days, tea and coffee are provided as well as use of the photocopier. Book now to reserve your place. Download booking form or contact the office on (02) 9283 3737.Full payment confirms your place in this workshop. Times: Fri. & Sat. 10 a.m. - 8 p.m. Sun. 10 a.m. - 4 p.m. 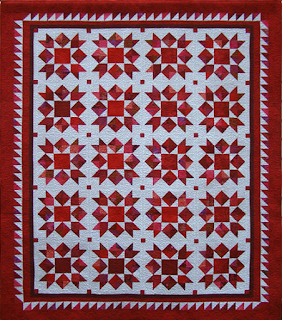 Judged competition " Take Three Colours &...................."
Second place Viewer's Choice was awarded to Rhonda Pearce for her hexagon extravaganza - Wade's Quilt. Congratulations to both Helen and Rhonda and thank you to everyone who cast a vote. Congratulations to Wendy Smith who was awarded Best of Show and Excellence in Hand Quilting for her exquisite applique quilt - Serenity. 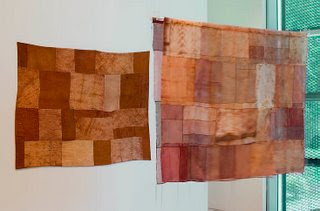 You can view her quilt along with the other prize winners in the gallery on the Guild Website. Prepare! sleep well and have a good breakfast. You will need all your energy for the big day. Dress in Layers - temperatures can vary and you want to be comfortable. Pack your camera - make sure that you have your camera along with a well-charged battery AND your memory device. You are welcome to take plenty of photos of quilts in the Guild area for your personal use only - that is viewed for your own personal pleasure. For copyright and courtesy reasons, you must NOT publish any images online or in any other media unless you have obtained permission from the relevant quiltmaker*. Anyone who wishes to publish images for commercial purposes must obtain prior consent from the Guild. Buy a catalogue - they are only $2 and you will find a useful layout diagram along with details and descriptions of all of the quilts. Meet a friend - you can share the pleasure and talk about what delights and inspires you. Cruise the market aisles - support our generous sponsors, we could not stage the show without them. Learn something new - there will be demonstrations in the Guild area throughout the show. Also demonstrations of techniques featured in the Art to Wear garments will take place daily: 10-11am, 12-1pm and 2-3pm. Kidskills activities will take place on Saturday and Sunday. Ask a question - our white glove floor monitors always welcome questions and guest exhibitor Helen Godden will be presenting a floor talk on Wednesday at 11.30am and on Thursday, Friday and Saturday at 3pm. Buy a raffle ticket - you might win a beautiful quilt or another fabulous prize. Be inspired - join the Guild at the membership desk, or complete a membership form, and enter your quilt(s) in Sydney Quilt Show 2010! * For more information about copyright, see the useful information sheets on the website of the Copyright Council of Australia. 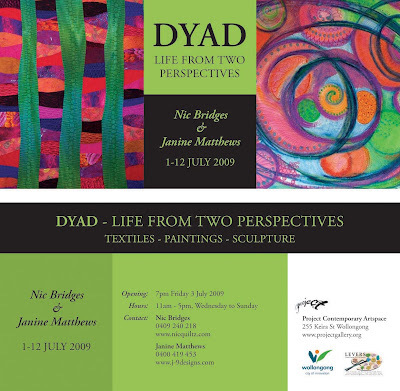 Congratulations to Guild members Dianne Firth and Pamela Fitzsimons who are among the textile artists selected for the inaugural Wangaratta Contemporary Textile Award and associated exhibition that opens at 11 am on 20 June and runs to 19 July 2009 at the Wangaratta exhibitions gallery, Ovens St, Wangaratta. 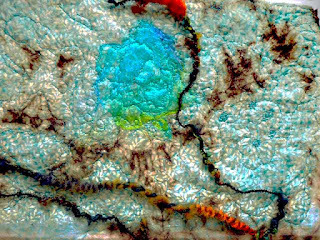 Textiles artists and designers have embraced innovative research techniques to explore complex concepts producing individual and innovative textiles. By exploring current issues of sustainability, environment and place combined with historical reference and new technologies, all are developing intriguing ways to inform the senses. This lecture will illustrate current research projects by staff and postgraduate students at the College of Fine Arts, UNSW and at UTS in Sydney. 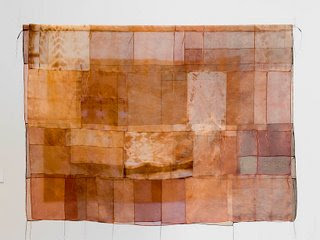 It will also document research undertaken in developing woven textiles for Liz Williamson: Textiles a solo exhibition held at Object Gallery, Sydney in late 2008 as part of the Living Treasures series and now touring nationally. 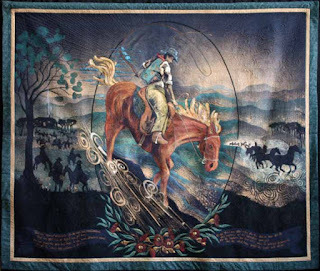 How the collection has developed and the range of works and techniques represented, including 19th century embroideries and 20th century printed and woven textiles.